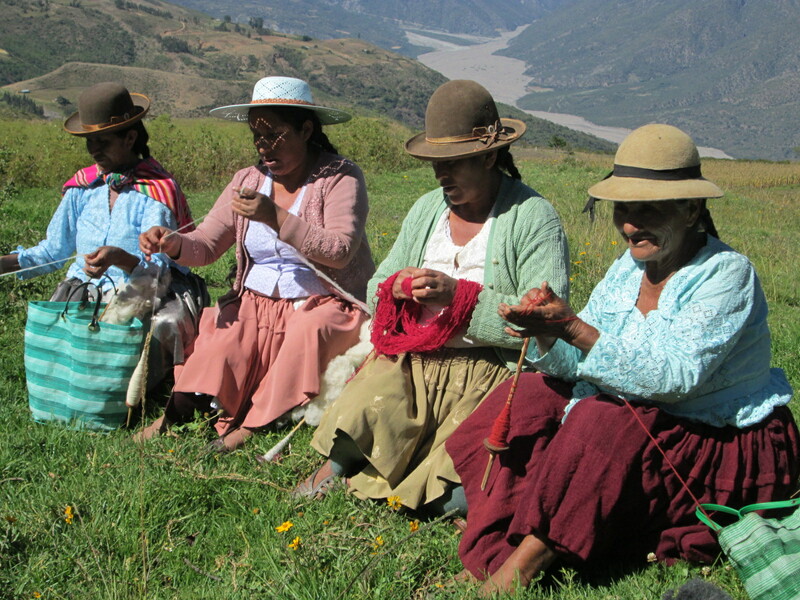 Doña Máxima´s role as the wife of this year´s mayor of the rural community of Huancarani includes weaving. 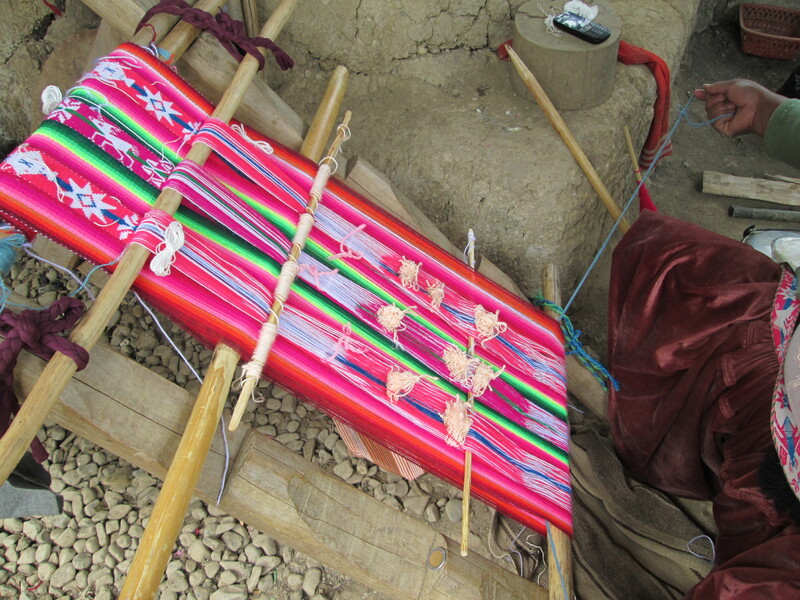 A lot of weaving on her rustic loom of 2 notched poles. The required hand woven mayoral regalia includes a ch´uspa (shoulder bag), a poncho, a belt, and an aguayo (a square cloth used to carry loads on one´s back). She´s hoping to find the time to weave an aguayo for herself as well. Her husband will also require a knitted ch’ulo which is the Andean cap with earflaps, traditional designs, and pom poms. The weavers of Huancarani offered their help and began by splitting up the skeins of purchased synthetic yarn to ply in preparation for the loom. The brightly dyed synthetic yarn is “traditional” for rural ritual, not the local raised handspun wool dyed with natural dyes. Doña Máxima began with the ch´uspa because her husband asked to have it completed in time for an April 5th meeting in Independencia. She sighed when she related that deadline and commented, “he doesn´t realize that weaving is a lot of work.” She would have loved to have devoted all her time to weaving, but she works 2-1/2 days a week for PAZA, plus shops, cooks, cleans, and hand washes all laundry for a family of four. She spent a day warping (vertical threads) her loom, trying to remember how to include 3 columns of double woven figures. She tied off warp threads with heddle strings in 3 places for each column. 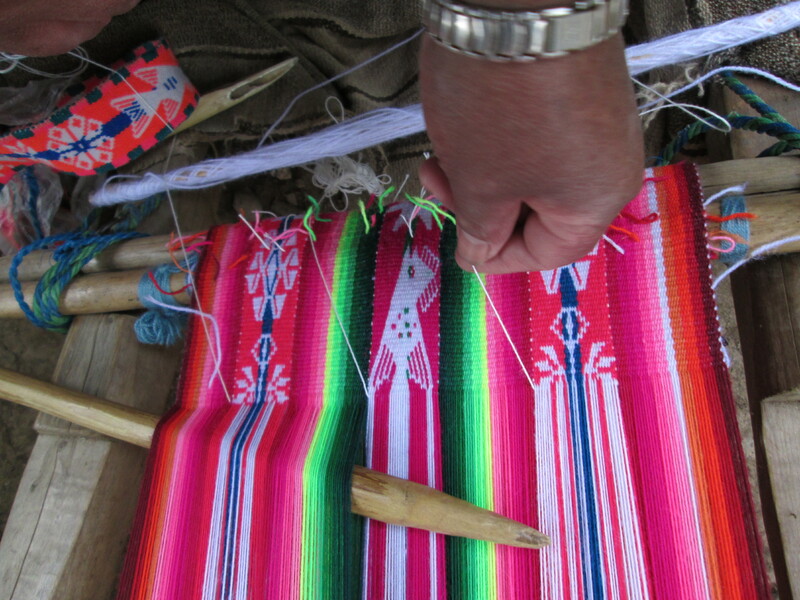 The weaving technique involves 1 weft thread (horizontal thread) wound on a stick (shuttle) to weave the cloth and 1 weft thread for each of the columns of figures. To create the motif she would hand pick warp threads in a column prior to each passing of the weft thread. Dorinda went to observe and photograph, and although it was the first time to view this complex weaving technique, she didn’t tarry. It was obvious intense concentration was to manage the 4 weft threads. A few days later, on another visit to check the progress Dorinda found a frustrated Doña Máxima at her loom. She´d progressed halfway through the weaving and knew she had forgotten something, so she had called her sister who lives in Huancarani. 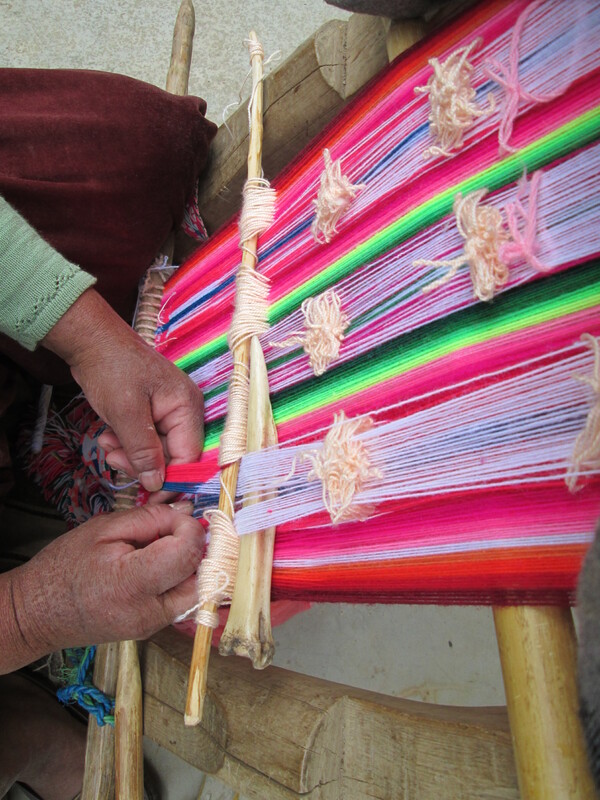 The doubling of the cloth to create the ch´uspa requires that at the halfway point the weaving be removed from the loom and turned upside down, so the second half can also be woven from the bottom of the loom upwards. That involved retying heddle strings for the 3 columns. Completing the ch´uspa was a group effort. 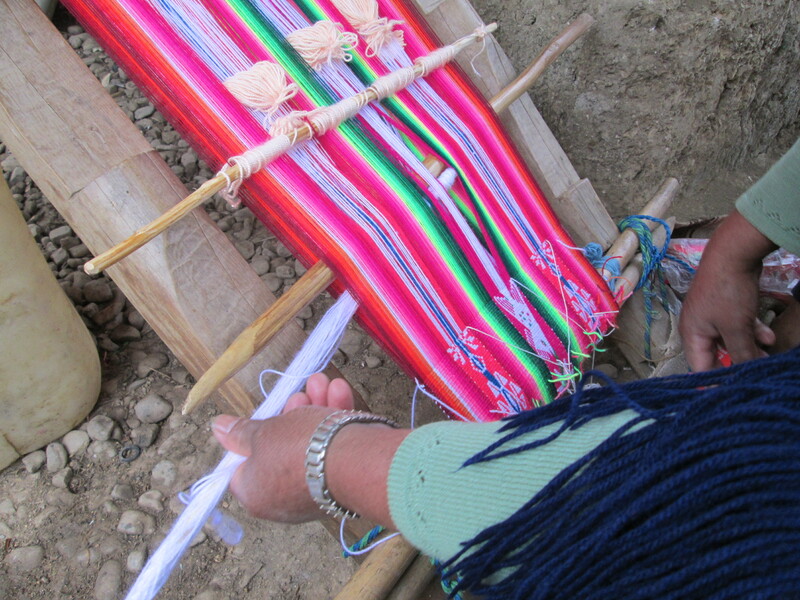 Doña Justina volunteered to weave the shoulder strap at her home in Huancarani. 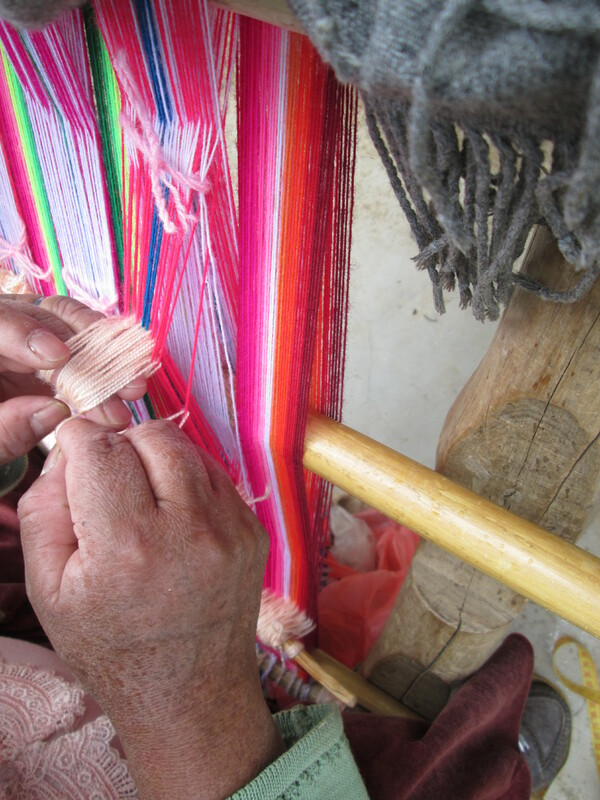 Doña Máxima cut the finished weaving off her loom and sent it to her sister in Huancarani to form the ch´uspa by weaving the sides together with a border technique. The strap wasn’t ready to travel with the ch’uspa back to Independencia the day before it was needed. Doña Máxima tacked a strap she had on hand to the top of the new ch´uspa, so it could debut at the April 5th meeting. 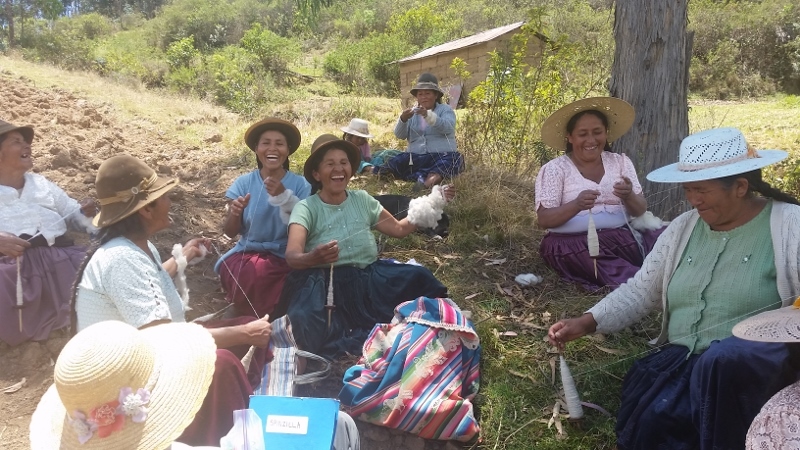 By next month´s meeting it will be refitted with the strap Doña Justina is weaving and adorned with numerous pom-poms. A photo will be included in the next blog posting. Doña Máxima´s next weaving project will be the poncho. Her husband has been using a poncho borrowed from Doña Antonia, who wove it 2 years ago in her role as the mayor´s wife of Huancarani. He told Doña Máxima he´s ashamed when he sees Doña Antonia that he hasn´t been able to return the borrowed poncho. 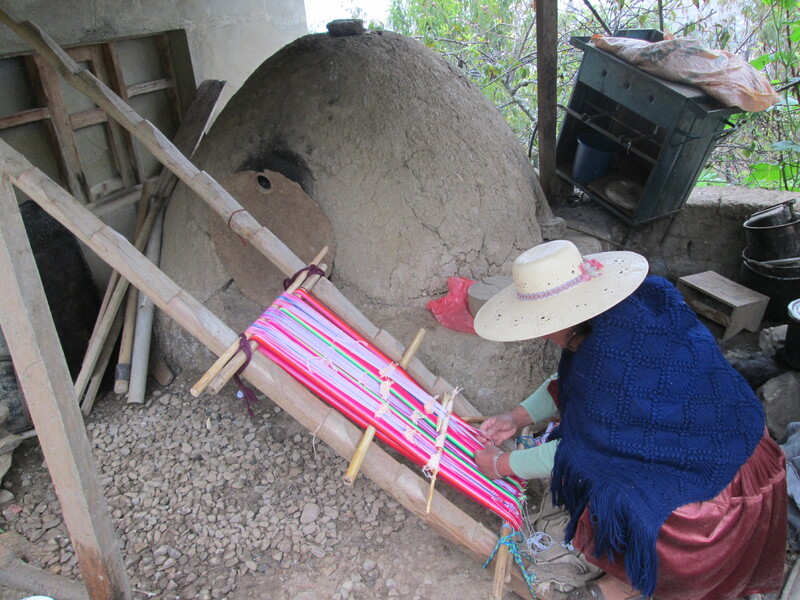 PAZA funds were used to purchase the $14.40 of yarn for the poncho in support of Doña Máxima´s weaving year. The blog will chronicle her work.